James Madison played a great role in defining, defending and establishing the United States as we know it. A major contributor to the Constitution, author of the Federalist papers and drafter of the Bill of Rights, Madison would come to lead the country he had philosophically and ideologically formed as its fourth president. 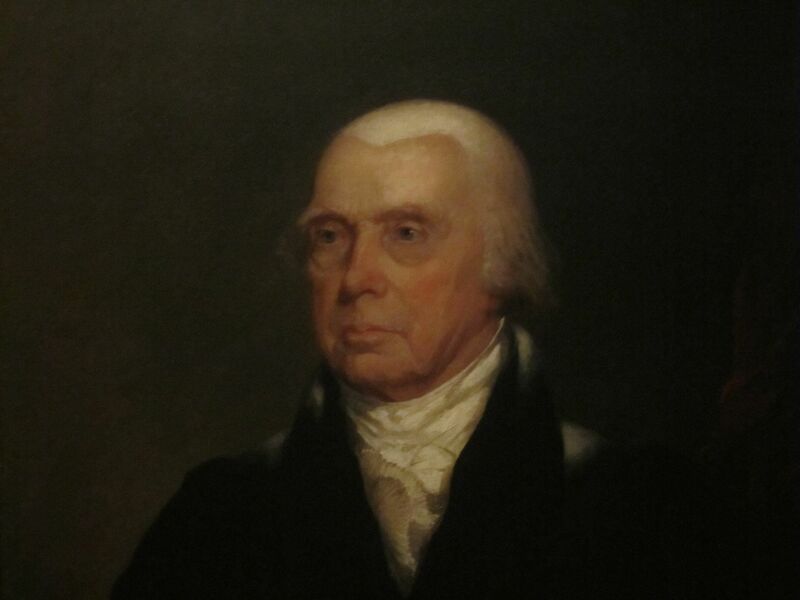 Born on March 16, 1751, James Madison was the son of a wealthy landowner in Orange County, Virginia. Madison attended the College of New Jersey (the future Princeton University). Since Madison had been tutored at home, he entered college as a sophomore, and quickly acquired a group of friends that included prominent political, religious, literary and philosophical leaders of the future. He also joined the Whig Party and engaged in protests against England, and still found time and energy to graduate in two years. Perhaps his ability to sleep less than five hours a night contributed to his productivity, but it probably did his already poor health no favors. Illness kept him out of the Revolutionary War, but enabled him to spend more time studying the law. He finally focused on being a contributing member of Virginia’s government and began his political career. A Princeton Companion: Madison, James, Jr.
Madison was a prolific and important writer as well as a political leader during and after the war. He first served as a member of Virginia’s Revolutionary convention. Although the notoriously nonreligious Madison ultimately found a home for his faith with Unitarianism, he was ideologically committed to separation of Church and state and drafted documents asserting Virginia’s commitment to religious freedom. In 1780, he became a delegate to the Continental Congress, where he was instrumental in the development and successful ratification of the Constitution. He had previously played a major role in drawing up Virginia’s Constitution, and America’s Library says it was Madison’s “Virginia plan” that served as model for the formation of a centralized government. When it came time to ratify the Constitution, some Revolutionary leaders expressed concern that the document would compromise individual rights. Reluctantly, Madison helped to assuage opponents’ fears by drafting and helping to pass the Bill of Rights. Madison went on to play a difficult role as Thomas Jefferson’s Secretary of State. The young country was butting heads with European powers, and Madison’s Embargo Act drove America into a period of financial depression. It was despite this fact, his White House biography states, that Madison was elected to be the nation’s fourth president. While his vivacious wife Dolly delighted Washington society, Madison led America into the War of 1812. During the war, the British actually set fire to the capital. Dolly Madison helped to rescue important papers, and her husband was responsible for repainting the president’s home white, inspiring its current name. The Library of Congress was entirely destroyed by the fire; to begin restoring the collection, President Madison signed an act of Congress authorizing the purchase of Thomas Jefferson’s personal library. After leaving office, Madison retired to Montpelier, Virginia, where he turned his attention toward academia and agriculture, using the most modern of available methods to cultivate his land. He was an active financial supporter of the College of New Jersey and also helped Jefferson to establish the University of Virginia. Unfortunately, a confluence of economic and agricultural troubles left him impoverished during his final years. He spent his last days bedridden, but actively writing letters opposing secession, until his death on June 28, 1836. This article was originally written by Rachel Balik; it was updated January 24, 2017.